Moving a loved one to a long term care facility can be stressful. Follow this packing checklist to help make the move smoother. Bring your sturdiest clothing. Long Term Care facilities have industrial washers and put them to hot temperatures to make sure that clothes are clean. This is to keep residents healthy, but can ruin delicate clothing. Keep in mind the health of the person going into Long Term Care. Can they dress independently or do they need assistance? What do they normally wear on their feet? Are they in a wheelchair, have a walker or walking on their own? If your loved one requires assisted dressing, there are many options to ease the struggle of dressing. Open Back Attire for bedridden residents or those that are wheelchair bound is the perfect solution. Buying open back tops for residents with reduced shoulder mobility can make dressing easier and painless. If they can still dress themselves on their own, let them pick the clothing they would like to bring. However, looking into elasticized pants or easy touch fastenings is always helpful. As fingers get older, sometimes buttons become a stressful chore, eliminating that part of the dressing process. Remember to be aware of their level of independence now but also keep in mind what they might need in the future. Undergarments are very important, each resident should have at least a weeks’ worth of underwear of socks and underwear. This can vary if they are incontinent; however it is still important in that case to think of diapers. If they are only wearing socks, often a Long Term Care facility will require that they wear slip resistant socks to prevent falls. Regardless of if they are able to dress themselves independently or not, keep their needs in mind. Are they generally hot or cold? Providing them with an extra comfy blanket or a wheelchair blanket can greatly help. Simply having some extra sweaters and shawls can also work. Having a special outfit or two can be nice for when they are going to events. Whether that be a special Christmas dress or a birthday shirt, having one nice going out outfit is always good to keep handy. Long term care facilities generally require slip resistant footwear. Slip resistant socks are helpful for night time trips to the washroom. However, during the daytime a comfy pair of slippers for indoors or a pair of indoor-outdoor shoes if going for walks outside is an options. 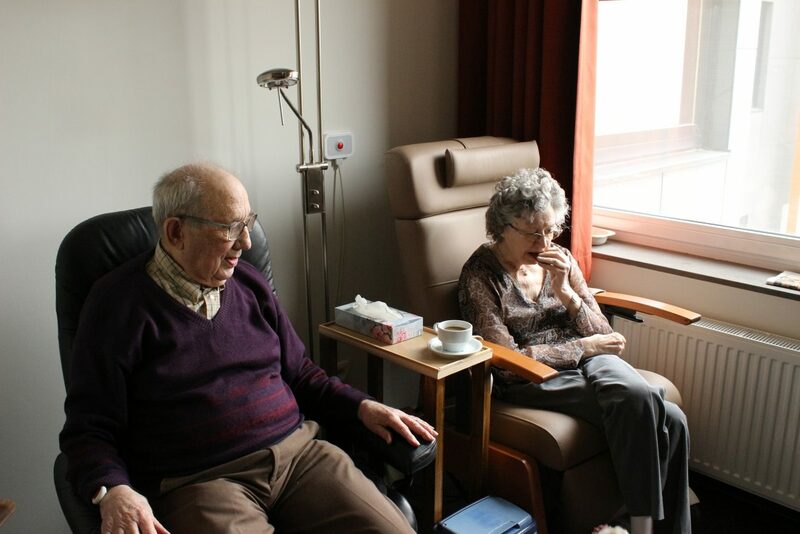 Comfortable and easy to put on footwear is key to a happy resident. Wide shoes and easy touch fastenings for those with swelling can be beneficial to make sure their shoe fits regardless of how swollen they may be. There may be other items that you may always see them with, whether it be a hat or handkerchief. These are important things to bring with them, so they can feel more at home. Glasses, napkins and dentures can all be items that can easily be misplaced, have a bag that they can keep with them at all times. A wheelchair or walker pouch can be great to put nick knacks in. Incontinence may be an issue as people age. If this is a problem, be sure to have lots of diapers on hand. Diapers and other sanitary products are items you will need to have. Medication is generally kept with an administration department or at a nurses station, but checking with nurses and the facility to see where they will be kept is a good thing to check in advance. Be sure to check with the long term care facility to ensure that there are no additional items needed. Bringing some things from home to make your loved one feel at home and comfortable is one of the most important parts.